A blog reader recently spotted a Platinum Preppy fountain pen in one of my recent blog posts, and asked how I "filled the barrel completely." That practice is called an eyedropper conversion (when you completely fill the barrel of a pen with ink, and then just screw it shut, that's called an eyedropper pen, because you used to fill with an eyedropper), and Platinum Preppies are famous for this. I love 'em. You can see the difference in ink capacity in the photo above - the 7 pens on the left are all eyedroppers, with nearly the entire barrel full of ink, whereas the 2 pens on the right are using Platinum converters, which hold only a scant fraction ink in comparison. I have no fewer than 7 (actually I have 10, I missed a few in my last count!) eyedropper Preppies going at once; that is my current favorite fountain pen option. 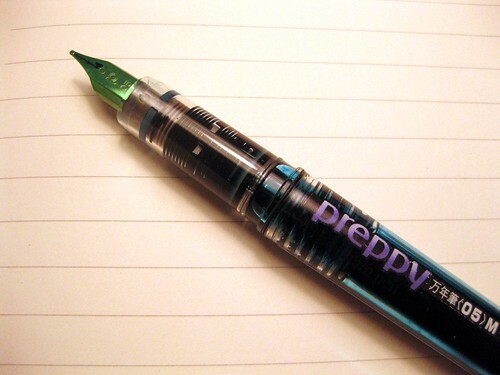 They write beautifully, they hold a ton of ink, and the Preppies have some thingamajiggy device (that's a technical term, folks) that is spring-loaded inside the cap so that it makes them extremely airtight, and therefore unlikely to dry up for months. You can see a close-up of it above. 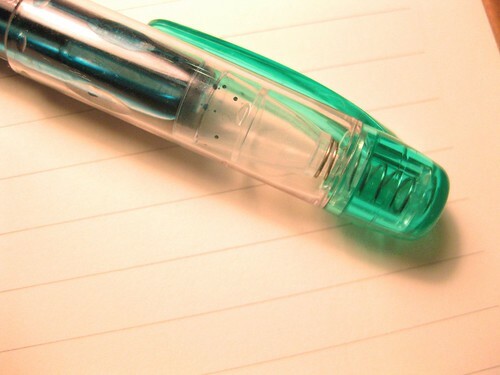 You can see above how when the pen cap is closed, the nib pushes it tight inside the end of the cap. That special inner airtight cap thingamajiggy is a handy thing for me, since - I confess - I do often neglect my pens. I can manage not to write with one of these pens for months (it's happened), and then when I pick up the pen again, the ink is not evaporated or dried up at all. Love it. But I digress - let's get back to the eyedropper info. If you are at all a pen or ink geek like me, you may think it's pretty cool to see that ink sloshing around in the clear pen barrel like that. 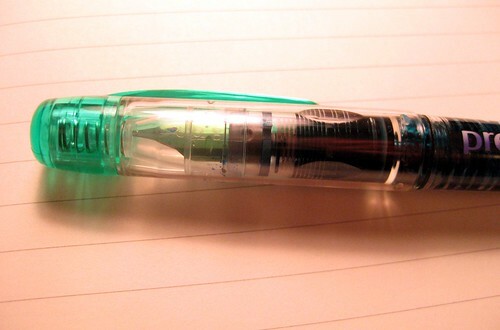 The ink in this pen is Iroshizuku Shin-Ryoku, a lovely deep green with quite a lot of blue in it. So, an eyedropper conversion is very easy to do properly, and there are tons of online resources to get you through it... even those of you that, like me, are loathe to undertake any fancy pen modifications. My favorite two articles are from JetPens and Goulet Pens (which are, incidentally, two of my favorite online retailers for all of my pen and ink needs). 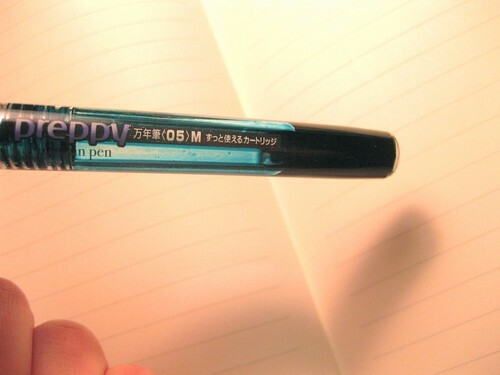 The JetPens article, "How to do an Eyedropper Pen Conversion, shows a really nice tutorial using a series of photos. I prefer step-by-step photos, because my internet connection does not always allow me to stream videos very successfully. Goulet pens has a tutorial, "Converting a Platinum Preppy to an eyedropper pen," and theirs has both photos and a how-to video. 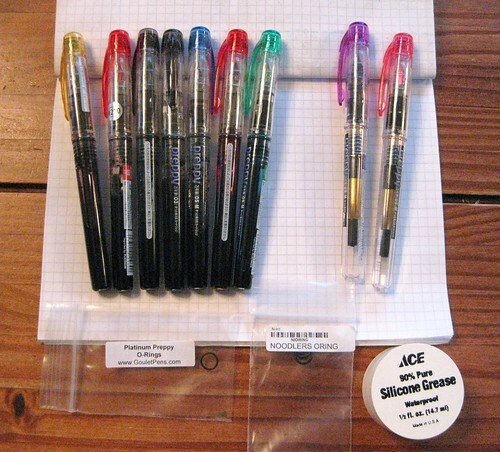 Both Jetpens and Goulet Pens sell the supplies (o-rings, and maybe silicone grease) to do the eyedropper conversion, which is extremely easy and no-fuss. I do recommend using the silicone grease. JetPens calls it optional, but I consider it pretty much essential. I have done countless Platinum Preppy eyedropper conversions, and only ever had one leak on me. The reason it leaked was because I screwed it closed too tightly and cracked the barrel. Platinum Preppies are very well-made pens, but they are inexpensive, and the plastic isn't perfect. When you have a rubbery o-ring in there, there's a lot of "give" when tightening the barrel. I thought, the tighter the better, but that is not the case. It's a little counterintuitive for me NOT to screw the eyedropper pen full of ink as tight as possible, but lesson learned; I close them gently now, and haven't had a cracked barrel since. 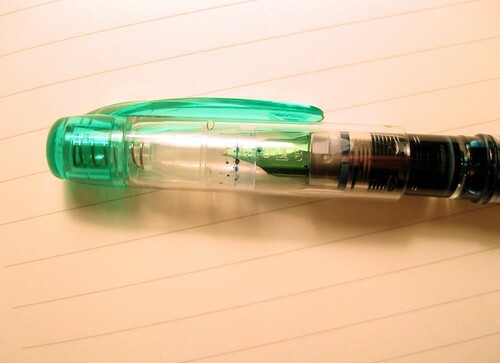 As the name implies, the first eyedropper fountain pens were filled with eyedroppers. There are some inks that come in bottles with eyedropper tops, and those are handy - but some people use a syringe to fill their pens. I use disposable plastic pipettes, which can be found all over the place (I get mine on eBay), and I know they are not terribly sustainable, but plastic pipettes keep your ink safer from contamination than a syringe would do. They are also faster, and require no cleaning because you just throw the darn things away. Granted, you have to be quite the intense fountain pen and ink geek in order to have a supply of plastic pipettes on hand, but... we all have our quirky hobbies. I am glad I am not the only one with multiple Preppy's all filled with various inks running around in my bag. :) Love them for writing and sketching. Do you have a link for the o-rings at jet pens? I have an order to place in a few days but can't find o-rings anywhere. Thanks. Hmmm... I can't find them now, either. My guess is that they used to sell them (I know I bought them from there in the past), but they don't sell them any longer. It seems getting o-rings from Goulet Pens is the way to go, unless you know how to get a hold of the right size in a hardware store. Oh how I love my Preppies. I hope to get a couple more of them next month. I love JetPens! I am a pen junkie, and for now a favorite is the Pentel Slicci. But for addressing postcards I use either a ballpoint pen, or an ultra fine point sharpie. Thanks for the valuable info. I ordered some Preppies and Noodler's ink samples for my grandson and me from Goulet Pens. Hey read your review and was motivated to do my own =) please check it out below (p.s. I linked you in my article too!). I also subscribed to your page. Thanks for the inspiration. I bought some stickers and other items from you a couple years ago. Love your stuff! Life has been crazy and outside of a couple letters and journal entries I really haven't had much time to write. I also love the Preppy! I recently have found a few spare minutes here and there and decided my pens needed a good cleaning and refill. My problem is this... How do I get all the water out of my pen cap? It's just stuck in there where the spring is, and I can't figure out how to get it all out. I'm afraid to try too hard, because I don't want to break anything. So glad you have enjoyed the stickers et al! I have never cleaned a Preppy, though I've refilled them in the eyedropper method as described above many times. I don't recall having the issue of water in the cap. I guess I'd suggest shaking it vigorously, or just leaving it out to air-dry for a while. Good luck, and let us know how it turns out. Encouraging to know you have 10 going at a time. Am encouraged to add to my three. Thanks, Paul - I had 10 going back in 2012, but just a few now.